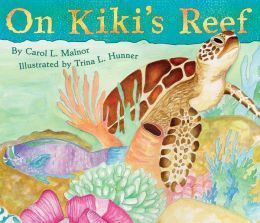 This wonderful story follows Kiki, a green sea turtle, as she grows and explores her undersea world, a coral reef. She starts as a baby, emerging from her egg and heading for the sea. She’s one of the lucky babies to reach the water, dodging birds and crabs. She grows and eats among the seaweed. The clownfish lives in harmony with anemone. Kiki is helped by tang fish, which eat the algae that grows on her shell. Groupers and wrasse also live in harmony. She must be careful of barracuda and sharks, especially tiger sharks. Kiki observes a seahorse’s camouflage, a parrotfish chewing among the coral, an octopus grabbing shrimp and snails, and a human diver. She barely escapes the human’s net. But Kiki does survive to lay her eggs and complete the cycle of life. Hunner’s illustrations are vivid depictions of what it must be like underwater. The reader gets a you-are-there feeling from the beautiful colors and many details. The last several pages discuss many facts about the creatures Kiki encounters. The author presents numerous reading activities and online resources, making this book a valuable teaching tool. The publisher’s website, www.dawnpub.com, is rich in resources, including teacher guides. Second graders and up will enjoy the story and learn a lot about turtles and ecosystems in general.